PuzzleMad: Make sure you spell it 'Porperly'! Make sure you spell it 'Porperly'! Aloha Kākou readers. It’s been a good long while since I’ve interrupted Kevin’s regularly scheduled posts with one of my own. The man deserves a break, wouldn’t you say? Though if you’ve read this blog for any length of time you’ll realize that he is quite mad for puzzles, to put it mildly (Ed - tell me about it!). Taking a break from puzzles or blogging about them is probably a form of torture for Kevin. But it will be brief. He always comes back with a vengeance after these little interludes (Ed - in fact I'll add a little puzzle to the end of your post Mike). Today I’d like to share with you a special item in my collection. It’s special because it is very well made, it’s clever, and it was not intended to be a puzzle, at least in the traditional sense. Also, it is metal, and we all know that high quality metal puzzles are hard to come by. So I was very excited to come across these two items about a year or so ago. The puzzle is known as the “Strong Box.” There are two, in fact, Strong Box and Strong Box 2.0. These little metal boxes are actually made for our cousins in the magic business. They are basically Lippincott boxes. They can be used (and opened) in any number of ways, but the important point is that only the magician knows the secret to opening them. 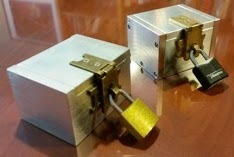 You might hand him a coin or ring, and after some flourishes, he will make it appear in the apparently ‘locked’ box. There are many types out there, of varying quality and with a (small) variety of mechanisms. Most are wooden, but a few are metal, and the “Strong Box” is amongst the very best of them, made specifically for the professional magician. Now, if you are going to do close-up magic with a locked box, you must usually let the audience inspect it. They have to be convinced that it is just a box and that there is no trickery. But in fact there is some trickery, and that trickery is precisely what makes a “gimmick” in the magic industry a puzzle for the rest of us. Obviously the mechanism has to be very well hidden and not remotely identifiable by casual inspection. 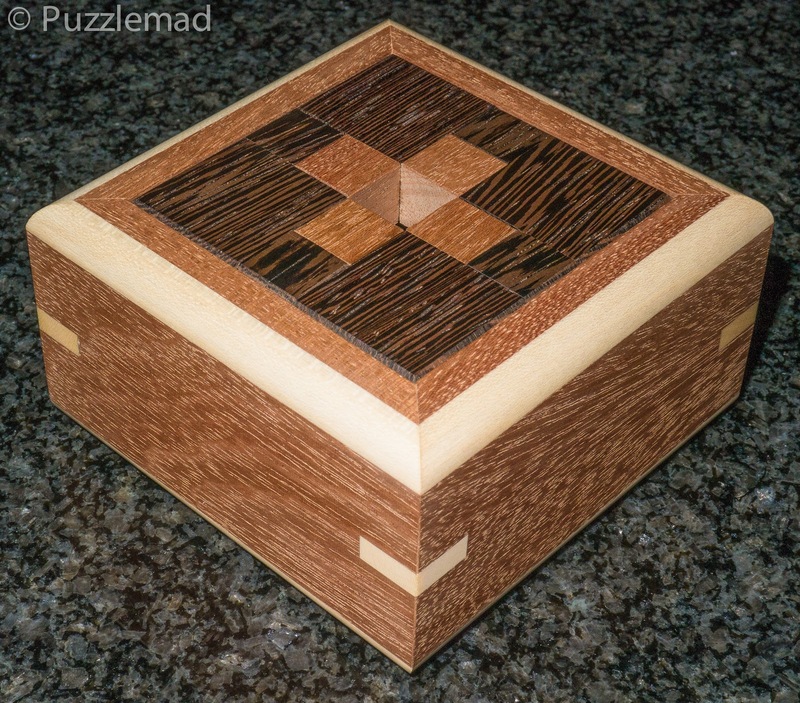 So what we have now, I’m sure you’ve guessed, is basically a trick or puzzle box. Fortunately for us, the magic guys are really good about not spoiling their tricks, so searching online will not easily produce a solution. Frankly, I think puzzlers could take a page from their book (What exactly are you trying to accomplish, outside of your own ego, by putting a solution on YouTube? And please don’t tell me it’s a public service). So having stumbled across this potential gem, I checked my finances and then proceeded to order a Strong Box, asking the retailer to please lock the keys in the box. It arrived and I spent the better part of a day, off and on, figuring it out. It is a great trick. Not completely unknown, but for whatever reason it eluded me for quite a while. I was overthinking the problem. A good lesson in puzzlery - start with the basic solves and work your way up. Rarely will jumping into a complex, elaborate solution work. It’s like looking in the freezer for your car keys. You will eventually find them, but first check your pockets (Ed - but I always put my keys in the freezer!). By the way, I let my officemate have a go at it and he cracked it in under 30 seconds. It’s expensive, so be aware that a quick solve is actually a possibility. And replay value is effectively zero. 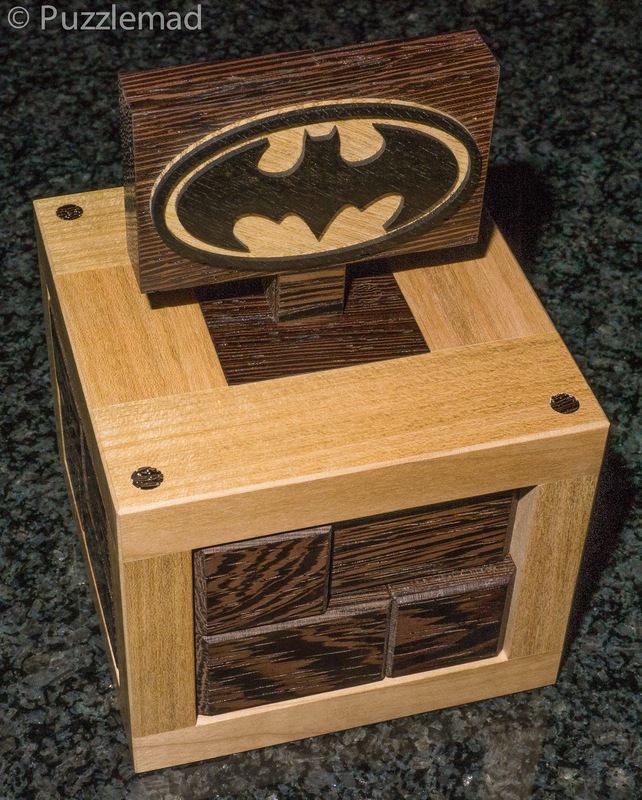 Strong Box and Strong Box 2.0 are made by a craftsman unknown to most of us, one Joe Porper. Joe makes a number of remarkable magic gimmicks which are worth checking out. His “real” business is designing and making pool accessories (billiards, not swimming). All Porper magic items are hand crafted (the pool stuff looks more mass produced, but still very high-end) and the pricing and limited availability are as expected. His craftsmanship is on a par with any puzzle maker working today, and all the more so because he works in metal. These little boxes sit on my shelf in the company of other esteemed metal puzzle producers like Wil Strijbos and Rocky Chiaro (Ed - I really need to get some Chiaro puzzles). I’m sure they feel right at home. At this point I have to bring up a somewhat sore issue, but it must be told. As with many, many items designed and hand-crafted by hard working individuals, Joe Porper’s Strong Box has been pirated and a version of it is now produced in China and sold widely on eBay and Amazon and wherever else. I would not recommend this to anyone else, but in the interest of research (yes, I say that earnestly), I bought one of these knock-offs to check it out. I really wanted to compare these two “Strong Boxes.” Well, I can tell you that there is no comparison whatsoever, except that they are both made of metal and the mechanism has been faithfully copied (and, I hate to admit, reasonably well executed). 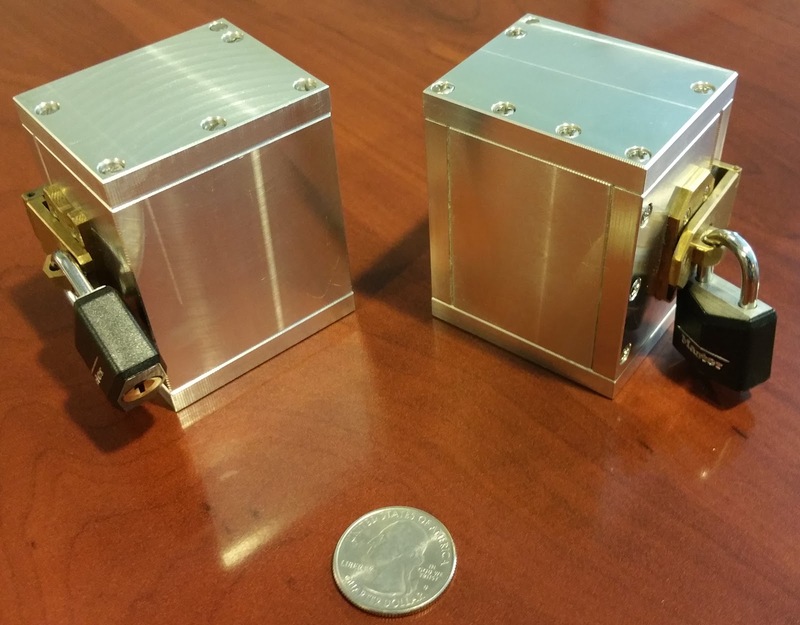 Both boxes are fashioned from machined aluminum, but the Chinese copy is cut from a solid block. It has a duller brushed finish and very sharp corners. The Porper box is machined with a nice polished finish (polished from the milling itself) and is constructed of a central ‘box’ frame, two side pieces and the lid, all screwed together. Edges are nicely beveled. The hasp is brass and looks to have been custom fabricated. The Chinese hasp is brass-colored, but I’m reasonably sure it is some baser metal. As the Chinese sellers and resellers say, their box functions just as well as the original, and this seems to be true. But there is no way around the fact that it is an almost exact copy of the Strong Box. 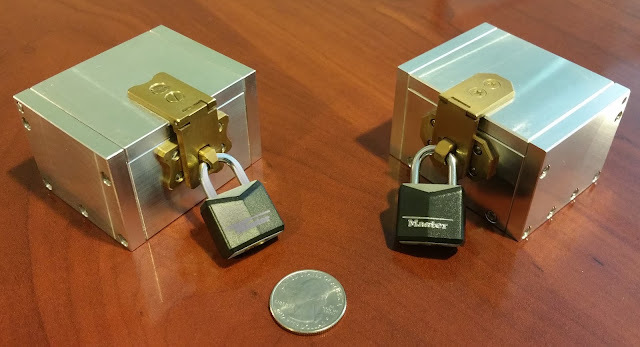 Frankly, I am not 100% opposed to other people making locking aluminum boxes (I doubt that the mechanism is even patentable). The bigger problem here is that the Chinese sellers (and non-Chinese resellers) market their box as an actual Porper Strong Box, which it most definitively is not. The ebay listings often show a picture of an actual Porper box. There are a few honest sellers out there, but there are many more who are not. It’s a straight up bait and switch. In fact, if you get the Chinese copy, they will send you a photocopy of Joe’s instruction guide to go with it. So you have been duly warned—there are no $30 Porper Strong boxes. And there are certainly none that ship from Guangzhou! I don’t know Joe or his story, but it seems that he was motivated, probably largely by the above, and possibly also by the fact that the original Strong Box solution was becoming too well known, to design and manufacture a Strong Box 2.0. This new strong box is almost identical to the original in appearance, having the same dimensions and similar construction. But the solution is completely different. And I must say, significantly harder. Strong Box 2.0 took me several days to master. For the longest time it was basically an impenetrable block. I couldn’t get in and nothing would budge. For any magic types that might be reading this blog, I can confidently say that no audience member will fluke this box and ruin your act. It is really good. If I were doing an act with the original Strong Box, I might have some lingering apprehension that there might be a guy like my skilled officemate in the audience. But not so with 2.0. It is a very secure box. And that makes it a very good puzzle. I really enjoyed it. I also think that there will not soon be a Chinese copy made - I very much doubt that it can be copied cheaply enough to make it worthwhile. Replay value, as mentioned, is extremely limited. Zero on the original. However, I do enjoy opening the 2.0 occasionally. It always takes me a minute to remember just what to do and where to do it. If you really want to get your money’s worth, try to open these discretely behind your back and put a coin in it, as per a magic act. Not so easy. They are very durable. Unbreakable would be more accurate. You can easily hand them around. The only fear I have is that some dope will scuff the pretty finish. Aluminum is pretty soft. Pricing for these little hand-crafted boxes is quite high, I am sorry to report. If you want one, Google around and they will pop up. I don’t think the original Strong Box is being made anymore, so for those you will have to get on the second-hand market. Prices in excess of $200US are not uncommon. But you should be able to get lower if you shop around and be patient. You need to check the magic retailers and resellers regularly. They have basically become collector’s items. I think Strong Box 2.0 is still being produced, but in limited quantities. Brand new, I think you would be paying $250 or more. But again, second-hand copies float around and you might get one for half as much. So ultimately you are looking at a serious outlay of cash to get into the Joe Porper game. For me it was worth it. I love metal and I love very high quality puzzles. And I love oddball things that straddle genera. Since I have your attention, here is a little column I am initiating whereby I divulge some quick puzzle info without committing to a full-scale review and discussion. Sometimes there are small items that just need to get out on the street, quick and dirty. Hence Mike’s slightly opinionated, but still polite, “Note to Self” which is really a note to you. For the record that the puzzle marketed and sold as the “Bank Tresor” is very poorly made and has an actual value of about $0.50 US. It probably cost much less to make it (it's made in India). This puzzle is sold by legitimate and respectable puzzle retailers and I know they need to make a living, but this is a Christmas cracker item. With postage you will pay upwards of $10 US for this and I guarantee that you will be disappointed in your purchase. The puzzling aspect is reasonable, but the actual construction dooms it. Note that I purchased three of them because I found them for $2. I accidentally dropped one of them about a foot off the ground and it split in half. Worse, another was so poorly joined that it was impossible to put the coin in it. So up to one-third of these puzzles may not even function. Bottom line, think hard about this purchase. I love coin release puzzles, but I hate garbage! In the last week or so Jakub from the New Pelikan Workshop produced a few new burrs and one of these was the Arrow puzzle designed by William Hu. Of course, I couldn't resist it when it went up for sale and did mention it on Facebook a week ago when it arrived. I am not sure whether I had anything to do with it but almost all the copies of the puzzle sold out afterwards. If you want it then go there quickly and nab one of the last few left. "Arrow is a high level galaxy type puzzle with 4 identical pieces. 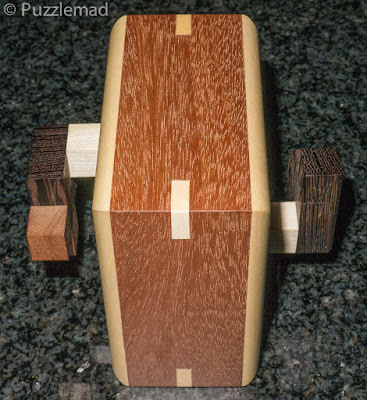 The trick here is that the tops and bases of the pieces are different shapes; two different arrow shapes. This makes a level 28.14 solution with a very fun sequence of moves!" Is a piece about to come out? NOPE! I took my photos and scrambled the pieces before trying the reassembly. It is definitely possible to do the reassembly without burrtools if you have spent as long as I did on the initial solution but for someone as dim as me - doing it from scratch would be impossible. I heartily recommend this puzzle - get it whilst you can - the price of €55 is not excessive. Whilst you are there you might want to get the first of Dan Fast's superhero designs. The Batman puzzle is also available from Pelikan and, as you can see below, it is just stunning! Made from Cherry, Wenge, Maple, Acacia and Ebony it is a work of art and with a level of 25.8.8.4.4.2.3 it will be quite a challenge. This will be my next puzzle to be attempted. 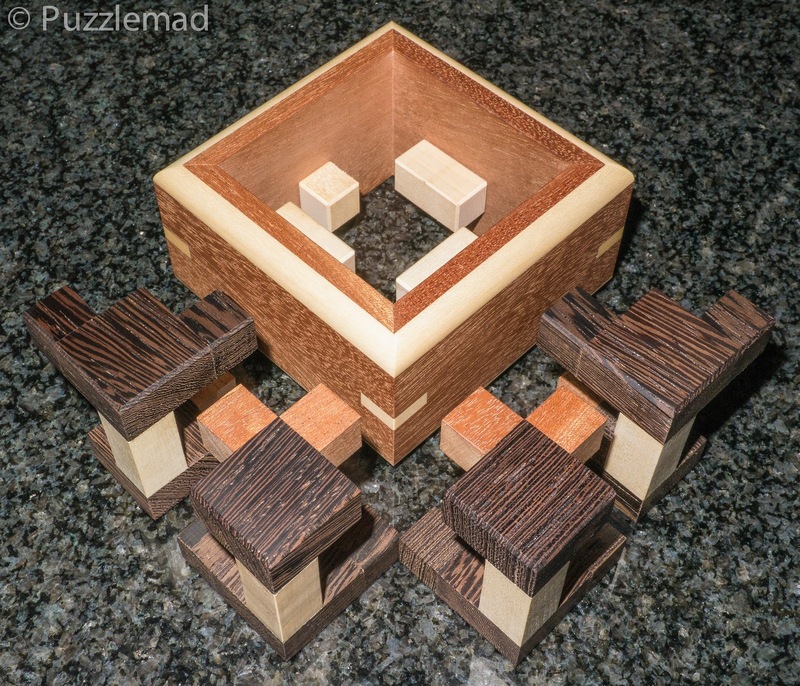 Of course I also have received a few new ones from my good friend and prolific puzzle designer Yavuz Demirrhan - the ones I received are not currently for sale as my delivery was held by customs for weeks. He does have a new batch up on his Etsy store. Excellent reviews! Thanks to Mike for a great perspective on two collectible boxes - Kevin, is that why you had Mike write about them, so you didn't have to break your misguided rule? And thanks to Kevin for hosting Mike and others to add their perspectives to this great blog. Cheers! Actually Steve, Mike just randomly sends me posts that he thinks could fit on my site. I don't ask for any of them in particular and am grateful that he takes the time to help out. I generally don't collect boxes but do enjoy them. With this particular pair, I had actually never even heard of them before!